To serve: guacamole, corn, tomatoes, red cabbage, etc. In a large, deep skillet, heat the olive oil and onions. Cook for about 5 minutes or until translucent. Stir in the minced garlic and cook another minute until fragrant. Stir in the rice and cook until lightly browned, about 3 minutes. Meanwhile, puree the canned tomatoes and jalapeño together until smooth in a blender or food processor. Add the tomato puree, broth, and seasonings to the pan and stir. Bring to a simmer and cover. Cook until all the liquid is absorbed, ~15 minutes. Heat the olive oil and onion up in a small saucepan. Cook about 5 minutes or until onion is translucent. Stir in the seasonings, beans, and broth. Simmer for ~7 minutes or until beans are heated and most of the broth has been absorbed. Simply puree all the ingredients together in a food processor until smooth. 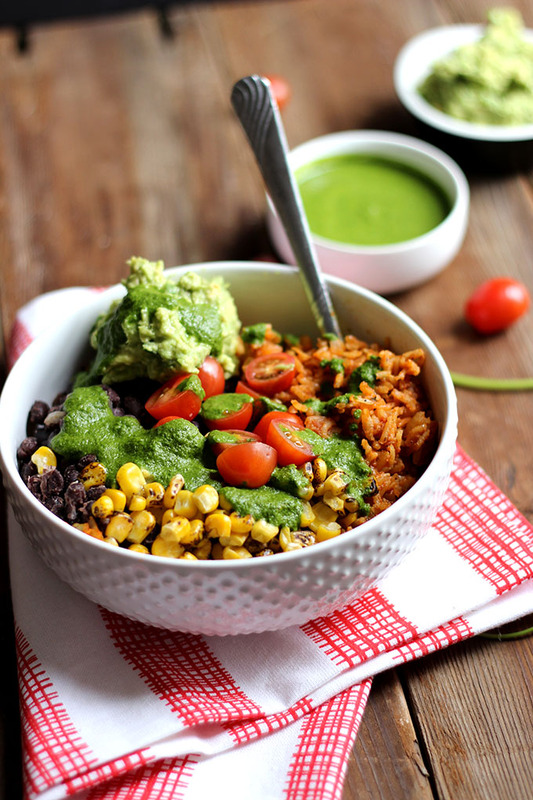 Divide the rice, beans, chimichurri, and other vegetables evenly among four bowls.